The island of Majorca in the Spanish Balearics may be regarded as a holiday retreat for many. Indeed, this group of islands, of which Majorca is the largest, attract many millions of holidaymakers each year. However, the geology of Majorca is truly fascinating and a study of a type of goat that once lived on this island has revealed a remarkable adaptation to a resource poor environment. 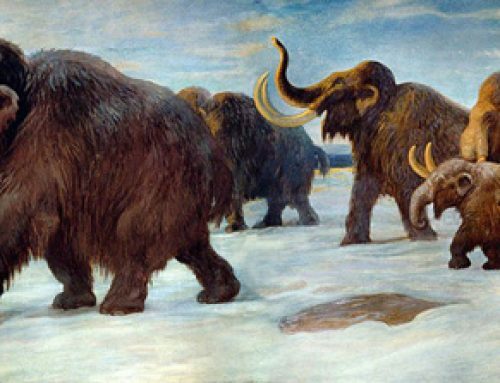 For one type of prehistoric mammal, the key to survival in a harsh environment was to live like a reptile. Amongst all this recent debate over whether dinosaurs were warm-blooded or cold-blooded (ectothermic v endothermic) comes a research paper published in the scientific journal the Proceedings of the National Academy of Sciences, suggesting that goats adapted to a resource-poor environment by changing their growth rate and metabolism to match the available food supply. A mammal living in the slow lane, developing a metabolism and growth rate more like a reptile’s than other mammals. This discovery is the first time scientists have seen this ectothermic survival strategy in Mammalia. Unfortunately, for the species of goats concerned, their adaptations may have eventually led to their extinction, once skilled human predators came to the Majorca. Co-author of this study into the prehistoric goats of Majorca, Meike Köhler, a palaeobiologist at the Autonomous University of Barcelona, Spain noted that the energy saving adaptations made these animals small, slow and easy prey for sophisticated human hunters when modern people came to live on the island approximately 3,000 years ago. A study of the fossilised bones of this prehistoric goat (Myotragus) were first found on the island in the early part of the 20th Century. The fossils show that this species lived, isolated on this island for more than 5 million years, with virtually no natural predators. In most large mammals, constant high growth rates and fast metabolisms require lots and lots of food to sustain them. Cold-blooded reptiles, relying on the sun to warm their bodies do not require anything like as much food as an equivalent sized mammal would. Since resources can fluctuate wildly on isolated islands, reptiles often displace mammals in such environments as the mega fauna. However, this new research, which analysed the ontogeny of several Myotragus specimens revealed that the goats may have adapted their growth and metabolic rates seasonally to cope with the limited amounts of food that was available – just like reptiles do. 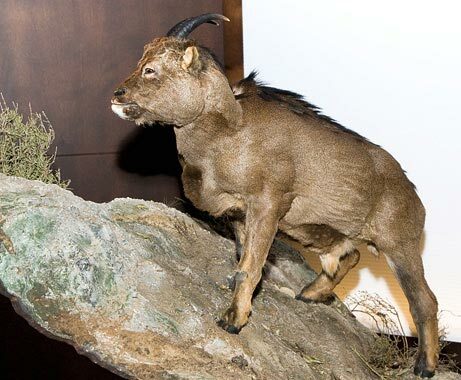 The picture shows a reconstruction of the Majorcan prehistoric goat Myotragus that is on display at the Cosmo Caixa Museum in Barcelona, Spain. “This way, it burned only the energy that was available from the environment, slowing down the ‘fire of life’ in times when resources became scarce”. The reptile-like lifestyle, however, meant that the newborn of this particular goat were extremely small, about the size of rats and the young would have taken many years to reach breeding age and adulthood. The goat may have saved a lot of energy by developing a brain only half the size of similar-sized ungulates and eyes only a third as large as other species of goat that existed on the mainland of Europe. The small eyes can clearly be seen in the picture above. The bone analysis indicated that the ontogeny (growth rates) was very slow for this particular species and these goats probably had a sluggish appearance. “Like modern-day reptiles, the goats probably “saved as much energy as possible just lying around and basking in the sun,” Köhler said. “The postcranial skeleton indicates that this animal was not able to run, jump, or move fast around, and [would have been] easy prey, ” added Köhler. A number of remote, isolated islands have provide evidence of the enormous ability of organisms to adapt to their constrained environments. Examples include giant flightless birds such as the New Zealand Moa, pygmy elephants and humans on the Indonesian island of Flores, and now a goat that adapted to limited resources by taking on the metabolism of a cold-blooded reptile.